A photo to put it all in context. I'd be nervous too if I had a bunch of people taking my picture and waiting for me to speak. There were flashbulbs going off every second. 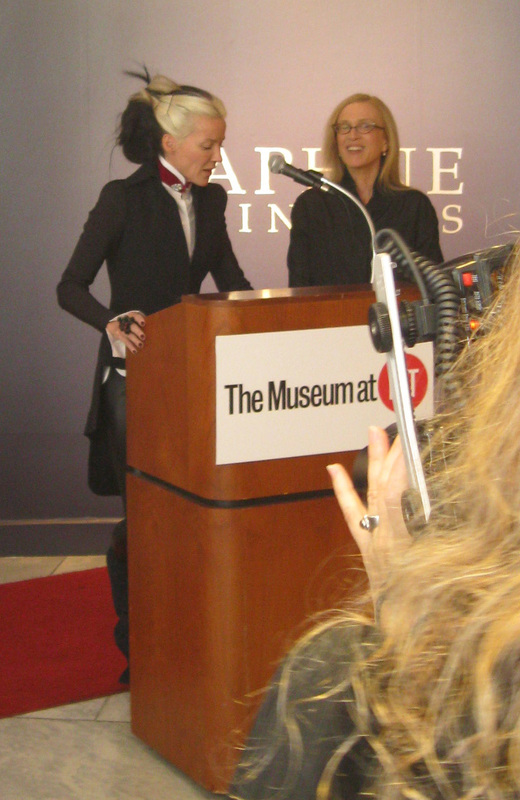 Daphne Guinness seemed nervous as she walked to the podium alongside Valerie Steele, director and chief curator of The Museum at the Fashion Institute of Technology, to address the press at the preview of the eponymous exhibit celebrating her style. Who can blame her? People (myself included) jockeyed for position to get a closer look. Flashbulbs went off everywhere. The attention seemed to get the best of her at first and at one point I thought she’d ask everyone to stop taking pictures. A close-up of the first picture. Notice the way she perches on the platform edge of her shoes. Steel approached Guinness two years ago about an exhibit highlighting her amazing couture collection. Guinness was reluctant at first but Steele won her over by convincing her that the show would be an inspiration to FIT students. Dr. Steele also said she and Guinness were in complete agreement that “fashion is worthy of preservation and appreciation.” They both noted that when they began to put the show together, Alexander McQueen, the late British fashion designer and a close friend of Guinness, was still alive. There are over two dozen McQueen pieces included in the exhibit that have never before been on display. Guinness, 43, said some of her inspirations included Diana Vreeland, Nancy Cunard, Josephine Baker, and the Duchess of Windsor. When I asked her to talk about her evolution of style and if motherhood changed the way she dressed—she has three children, Stavros, 22, Alexis, 20, and Ines, 16—she said she didn’t dress the way she does now when her children were small. She also said she found she made style mistakes over the years, which she said, “helps to define you, you learn.” She finds she’s now influenced by the people she is around and the projects she is involved in. She looked right at me as she answered my question. I found her articulate, intelligent, shy, and charming. She has big beautiful brown eyes, an English accent, and a way of making you feel as if you and she are the only people in the room. Valerie Steele did a great job of engaging Daphne in conversation and putting her at ease. I also think Daphne realized she was among fans and friends, all lovers of fashion! She noted that in her youth she wasn’t interested in fashion per se, she was more attuned to artists, but she liked the idea of using fashion as a form of defense. She also said that growing up in London she knew she was an “anti-Sloane Ranger,” which drew a laugh from the crowd. She said that while those young women wanted to wear “the little sweater and the little skirt,” Guinness herself had other desires. “I wanted to wear studded leather,” she said. The photo of Daphne just outside the exhibit. 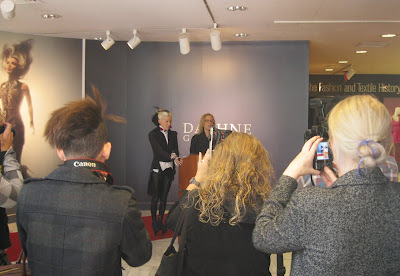 Daphne Guinness is on view at The Museum at FIT through January 7, 2012. What a fabulous post Jill. 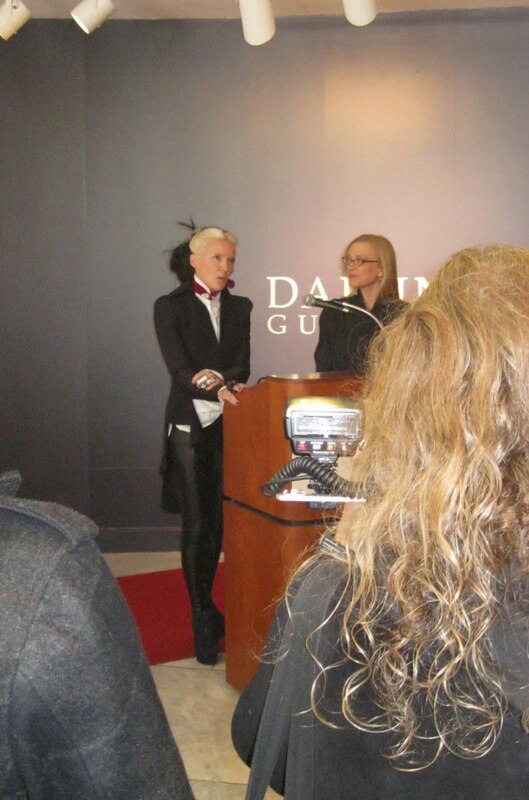 Talking to Daphne Guinness must have benn quite a thrill. Thank you so much for sharing, dear friend. what a wonderful experience- you make me wish I were there. How cool to be able to interact with her directly?! I think she is so fascinating. And I've always loved that she doesn't accept freebies from designers. That's a rare and very liberating approach. Great post Jill! This was a fascinating account of the event and a glimpse into the mind of a fashion icon - what a great experience it must have been. Congrats on making IFB too! Hi Sacramento, the remarks given at these press previews are always so interesting and I learn a lot, not only about the subject at hand, but also about who shows up at these events. How are your NYC plans coming along? I've told Bella that she needs to fly back here to meet you. She agrees! Hi Serene, I am so with you, I love Daphne's hair! I have to put the blonde stripe I used to have back in my hair, asap, in honor of her. Hi Rosemary, I want to know what you think when you see this show. I can't wait for the catalog to come out, it will be available in October. Hi Wendy, thanks for stopping by! I have to take mingling lessons from Bella, I was so close to meeting you at the MO Bar the night of the IFB Con cocktail party. I still don't know what happened to prevent it. Boo hiss! I hope I get a do-over soon. Hi Bella, if you'd been at the press preview I know you and Daphne would be good friends right now. Who can resist you? Hi Vahni, I know just what you are talking about re Daphne's approach to fashion, she is buying these clothes, she is not accepting them for free. And I love her fearless style, I really could take a lesson from her, which is why I so badly wanted to ask her a question. I wasn't expecting to be this inspired by the exhibit but she has me rethinking everything. And if that's not the sign of an icon I don't know what is. Hi Veshoevius, thank you for your kind words. I love me a costume exhibit with remarks to the press! And after seeing the amazing couture Daphne owns it was wonderful to hear both her and Dr. Steele speak about the collection and fashion in general. Once more you opened a box I did not even know it existed - Daphne Guiness is not known around here. Thank you for posting this coverage. Exciting event! I would have been excited. Those flashbulbs can be really annoying! I enjoy visiting your blog! Hi Paula, thanks for stopping by! I will confess that until last year Daphne Guinness wasn't even on my radar. And when I talk to people here in Brooklyn about the exhibit, most people say they don't know who she is. Very interesting, so she is known in Manhattan society, but not necessarily known outside of it, at all. I am a new fan of hers, her look is all her own and it really seems to be who she is. And she is very compelling and charming in person! What I found so interesting in the exhibit is that I could really relate to the couture that was just beautiful and simple--skirt suits in wonderful fabrics, with gorgeous details. And now that she is on my radar, I'm noticing more pictures of her wearing these quieter things, but with outrageous platform shoes, a ribbon around her neck (love!) and carrying an AMAZING green crocodile Hermes Birkin. I know the crazier things get more press, but there is another side to her, that love of mellow, beautiful things, which I really relate to. Wow!! I am so jealous that you got to see her speak, and ask her a question! I love Daphne Guiness and have photographed her a few times at Fashion Week, but have never had the chance to speak to her. Her sense of style is amazing, and I love the fact that she loves couture and appreciates the beauty of it. Hi Sarah! I am so glad you are at Paris Fashion Week getting great pictures. I feel like you are my own personal fashion reporter out there getting the story, just for me (I'm happy to share with others, of course)! I find myself suddenly a big Daphne fan, love the hair, love the shyness (I can so relate), love how personal she was when I asked her a question. It really did feel like everybody else had left the room and it was just us. And don't even get me started on the clothes. I'm having a hard time picking the next look for 'Daphne Wednesdays.' There will be looks throughout October and into November!